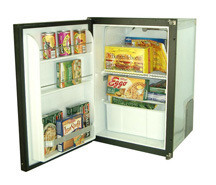 Nova Kool | Ocean Options, Inc.
With 6 models to choose from 1.9 cubic feet to 5.8 cubic feet these refrigerators and efficient, quiet, and have adjustable low voltage protection to prevent complete battery discharge. With 8 models ranging from 4.2 cubic feet to 7.5 cubic feet these units are efficient, quiet and have an adjustable low voltage protection to prevent complete battery discharge. They feature a rugged 18 guage epoxy steel frame which is by far the strongest in the industry. 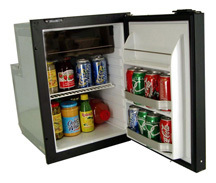 With 5 sizes to choose from ranging from 6.0 cubic feet to 9.1 cubic feet these units are efficient, quiet, and have adjustable low voltage protection to prevent complete battery discharge. They offer solid polyurethane foamed cabinets and doors and an easy to clean polystyrene interior. The ice box conversion kits have efficiently sized air cooled condensers for simple, reliable installation and service with no pumps or extra plumbing to contend with. The compressors have variable speeds and will operate on a 30 degree angle.These kits are perfect for mobile applicaitons. 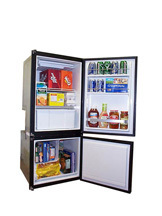 With 6 front load sizes ranging from 1.9 cubic feet to 5.8 cubic feet and 1 top load unit with 2.5 cubic feet these freezers and efficient, quite, and have an adjustable low voltage protection to prevent complete battery discharge. The flange kits provide a way of converting the Nova Cool units to fit directly into the existing cabinetry without expensive and time consuming cabinetry modifications.